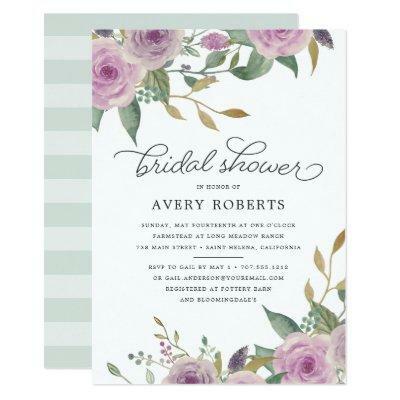 Elegant and delicate, our Violet & Sage bridal shower invitation features watercolor flowers in muted shades of pastel lavender purple and sage green at the corners, framing your bridal shower details in classic off-black lettering. Cards reverse to subtle sage green tone-on-tone stripes. A beautiful choice for spring or summer bridal showers in garden or outdoor settings.